We spent a big chunk of the weekend getting the inside of the barn ready for what has already begun happening to the outside of the barn. Friday the big machinery moved in, plotting and digging for the footings of the new additions. One day’s work has left the barn entrances surrounded by a 3 foot deep moat with rebar lurking in its bottom. The horses are grumpy about being banished solely to the pasture. 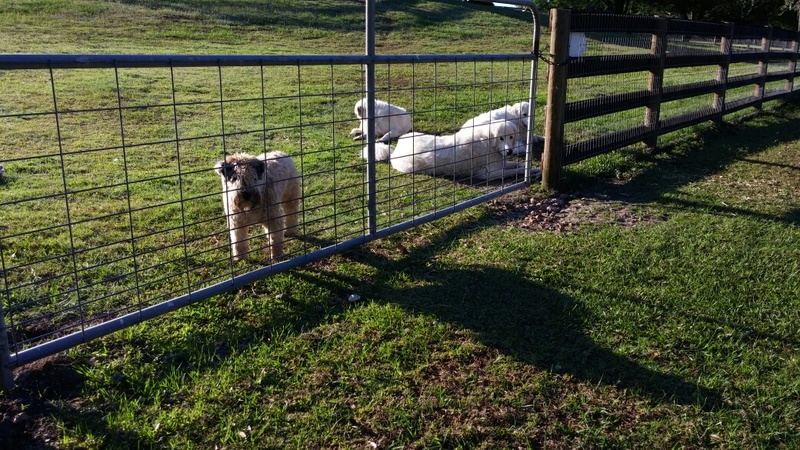 The dogs are forlorn about being banished solely to the backyard. In short, none of them are happy about our rampage of transformation, but they have no awareness for what good things lay in store so I will give them the benefit of the doubt. The cement work is happening first. This week, in addition to the new footings, they will lay down cement in the center aisle and around the outside perimeter of the old section. 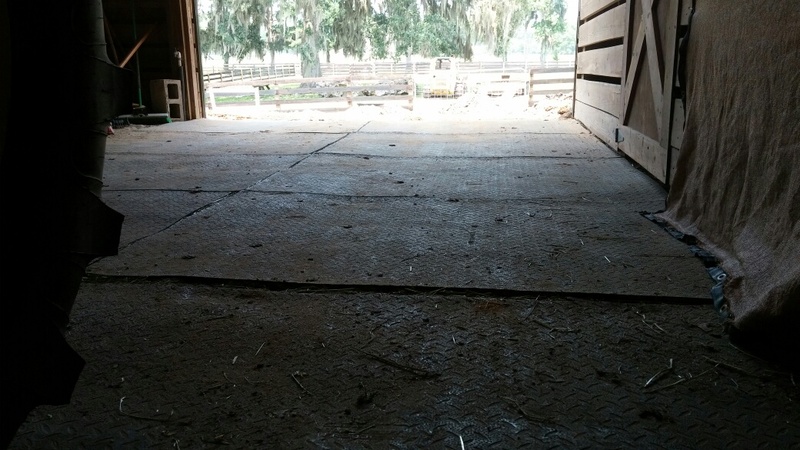 The floor of the original barn is packed ag lime only and the center aisle, though protected by rubber stall mats is uneven and lumpy. It will be dug out and leveled for the cement pour, so one of our tasks this weekend was pulling up all of those stall mats which weigh about 100 pounds each. That was a lot of fun. 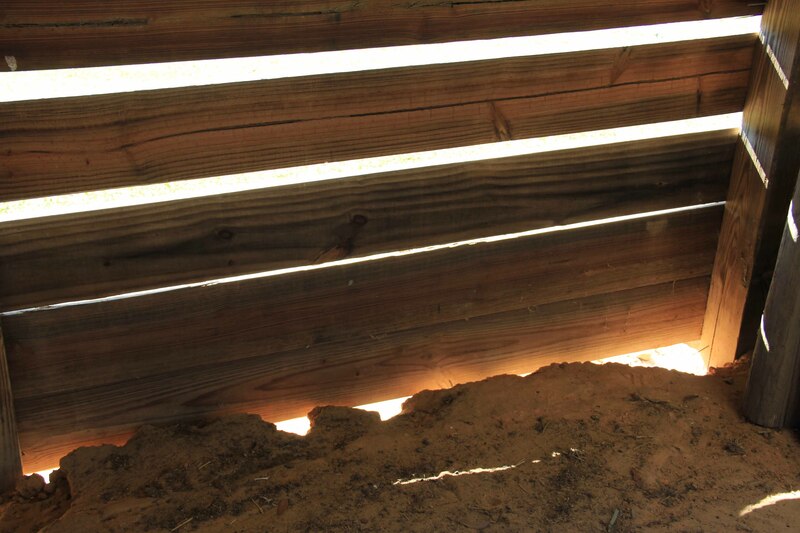 We will keep the ag lime footing in the stalls for the horses, but the lack of foundation around the old section has allowed a fair amount of erosion. Adding a cement “paw pad” around the perimeter will serve as a bumper to retain the footing and also prevent the horse from pawing through. The current perimeter has gaping holes. 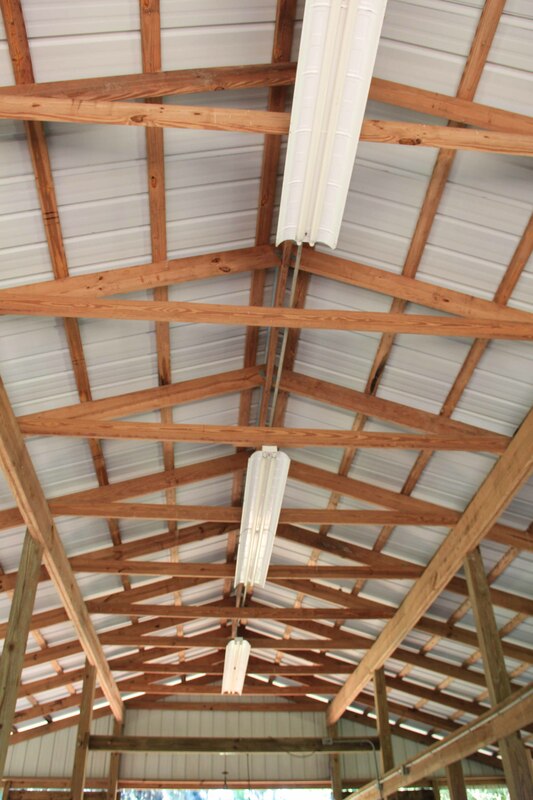 The barn is framed on four foot sections, not the three feet considered essential for true storm worthiness and the long term life expectancy of the roof. As if to prove this point to us, there are areas of water damage and rot, some of which have been “repaired”, some have not. All of these sections will be replaced and new framing will be added in between the existing joists at two foot intervals. 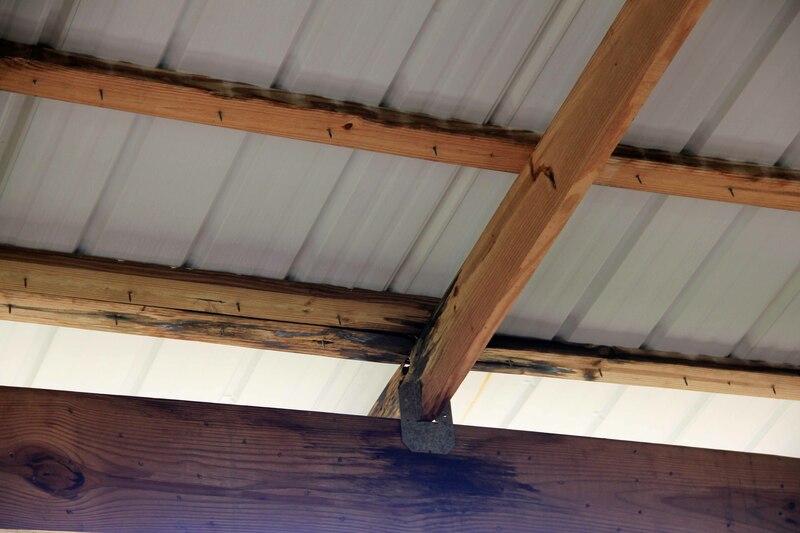 The eave overhang will also be extended another two feet to provide greater protection and coverage for the soffit area. All of this will be topped with a new roof spanning the length of the old and new sections. 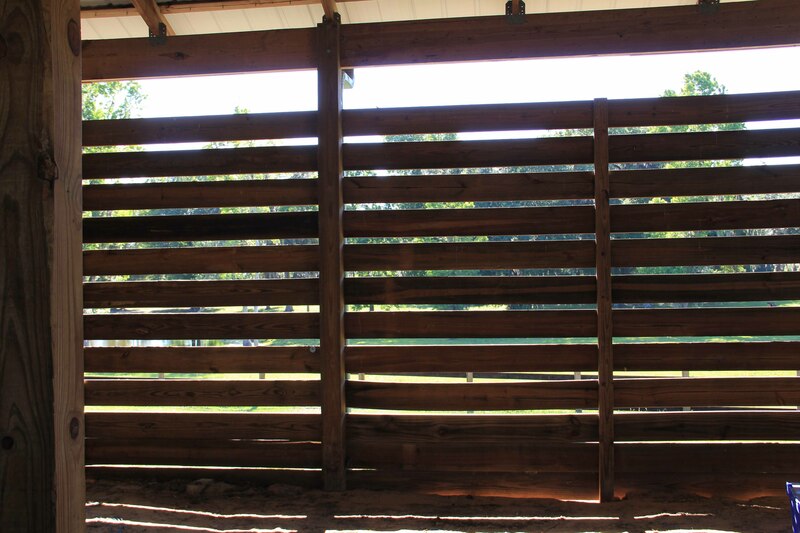 The outside of the barn is one by eight board nailed horizontally with two inch gaps for “ventilation”. We have not been here long enough to experience a rainy season, but the two big blue tarps hung on the inside of the west wall were evidence enough that this “ventilation” strategy had its drawbacks. 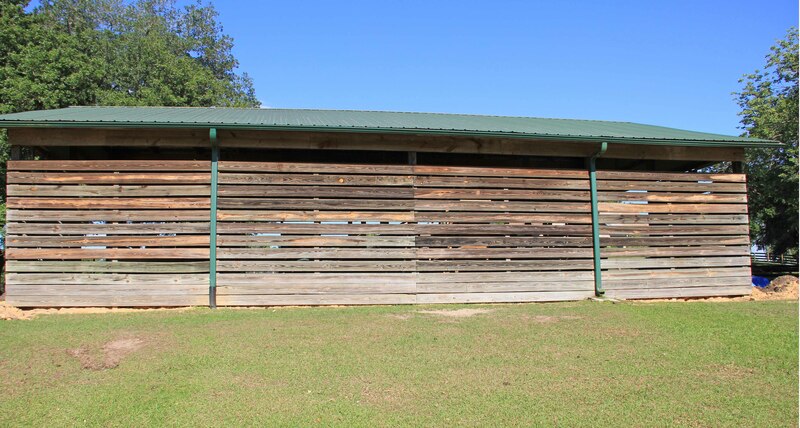 We will be adding siding, southern pine planks hung vertically, to the outside, but the existing boards will remain and become the interiors of the stalls. The outside will become the inside. 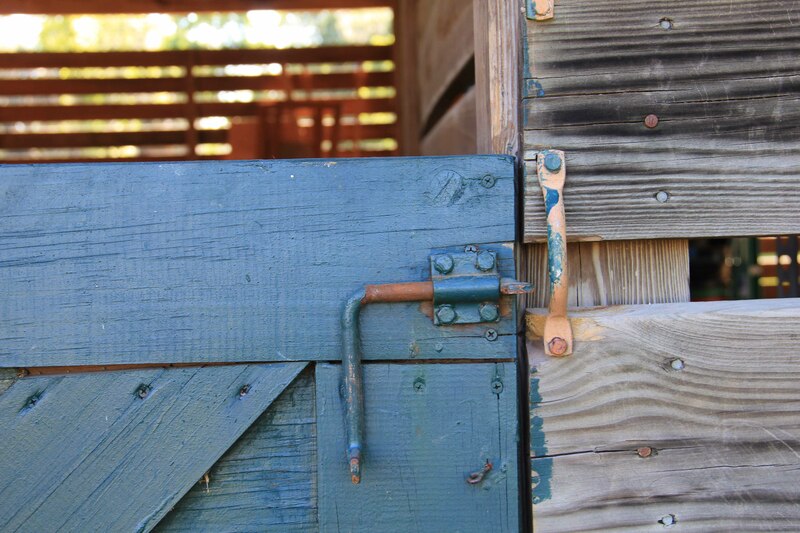 Four new stalls with dutch doors. 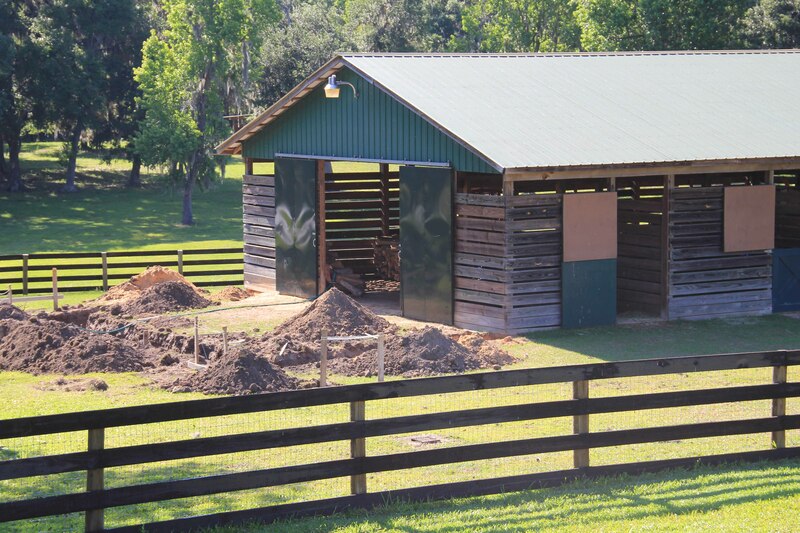 And because those doors will be all wonderful and new, the existing stall doors, which are heavy and warped and are the view of the barn from the house will be replaced as well. Up close and personal on the old doors. 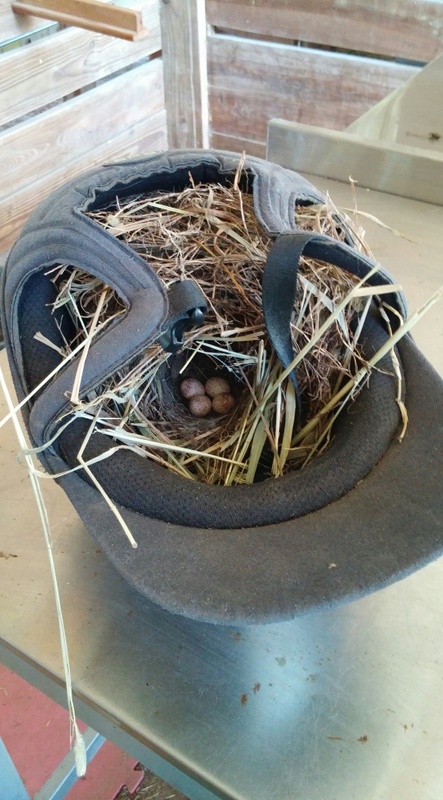 A mama bird had made a nest in my old helmet, tucked high up on a storage shelf in the barn. So we are all displaced, the horses and donkeys and dogs and me, but the shelf stays, because the mama would not follow a displaced nest. I have protected her area as best I can; I can already see the eye rolling from the workers at the “do not disturb” signs I have posted. We will all get through this; the craziness lasts for only a short amount of time really. Hope the mama bird has the same attitude.